When I read the e-mail from the new owners of Skully AR helmets, the one line that really got my attention was when they said "We are determined to make this right" for people who supported the original Skully company and got burned when it went bankrupt. That made me wonder just exactly what the new ownership had in mind, in terms of making customers whole. I also wanted to know what plans they had to bring back a tarnished brand. To get some answers, I got an interview with Skully Technologies Chief Operating Officer John Lauten. Spurgeon Dunbar: Skully Technologies has acquired Skully Inc. Can you explain what you actually received in the acquisition? John Lauten: What we acquired were the assets. We received whatever remained of Skully Inc. after the bankruptcy, plus the patents and the trademarks. So we own the trademark of Skully in countries all over the world along with any patents that were filed. SD: Does the new ownership have any relationship with the original founders, Mitch and Marcus Weller? JL: We're in touch, like you would expect with an acquisition. So hand-offs, information upfront, kind of contact. SD: With all of the negative press surrounding the Skully name, why not take the assets and start a new brand? What was the reasoning for carrying on the Skully name? JL: Very good question. So when I joined Ivan (Contreras) this year, that was on the forefront of our discussions. The Skully brand has a tremendous market awareness. There are hundreds of thousands of followers of Skully, even to this day. You know, you read about people saying what a shame it was that Skully went under. Ultimately, we believe this is a brand that has a following that is welcoming its return. It is a lifestyle brand. It's achieved a sort of premium brand awareness that we decided to retain and invest in. SD: But you also have this dark cloud hanging overhead. Some people have commented on articles and Facebook saying things like, "I'll never touch a Skully product again." What's your response to these people who are clearly still upset and angry about how Skully Inc. ended? JL: There is the brand, and then there is the former company. With the former company, nobody has anything good to say. We are a new company with new leadership. Ivan and Rafael (Contreras) are hiring a top leadership team in the U.S. that has a lot of experience with supply chain, customer service, finance, and technology. We have nothing to do with the old company. We stand for leadership. We stand for transparency. We will not over-promise. So in that way, we're going to be a different company. The brand, the product is what we want to restore. I do feel everybody still wants to have Skully in their hands, in their garage, and to ride with. That's a separate item, and that Skully product is something we all believe in and are passionate about. The Skully Fenix AR helmet is just the beginning of the plans the new management has for the company. Skully photo. SD: So in the email that was sent out, as well as your website, you’re stressing that you’re "Determined to make it right." Exactly how do you plan to do that with the folks who invested in the original company? JL: One of the reasons that Ivan and Rafael hired me is because I have a very strong background in customer operations. I believe in customer service excellence, and this was a primary issue for me when I joined the company. We have to make it right. You cannot keep the name, "Skully" and the product without mending relationships with those enthusiasts who contributed from the beginning. So the "Make It Right" campaign is at the forefront of what we're going to accomplish. It is a review of all of those enthusiasts that invested and contributed towards a Skully helmet, but who never received the product. It is the first thing we need to accomplish, to re-establish the trust and the passion in our fan base. We're going to try and marry up contributors with their helmets and give them the chance to have the helmet that they've always desired. It's part of our core values, going forward. Skully Technologies is going to stand for being devoted to our customers. We're going to be transparent about everything that happens and we're going to make it right. This is quite a hurdle to overcome, but we're very excited about the challenge. SD: Will you just be offering those initial investors the first opportunity to buy one of the new helmets? Or are you going to ship them the helmets they were promised by the old company? JL: Spurg, the intent is, and we've already started communicating to those enthusiasts that had contributed towards the helmet, that the intent is to give them a helmet. We will validate the order. We have data from the previous company on who ordered or contributed. So our intent is to make them whole. We're gonna make it right. What's interesting is that in the initial emails we're getting back from our fans is they are saying, "Can I order a second one while you're at it?" I love that sentiment, and that's the company we want to be. Right there. SD: A quick glance at your LinkedIn profile shows you have worked with some impressive companies, from FOX Racing Shox to Cisco. What made you decide that this was something you wanted to take on next? JL: I think that this new company, the new Skully Technologies, represents an incredibly fascinating challenge that marries my strengths and my background. You mentioned Fox Racing Shox. I spent three years in that world. I came to appreciate the enthusiast culture and the following that these kinds of products represent. This brand is so broken because the previous leadership had failed to deliver on customer promises and the customer experience. I've been part of this type of turnaround many times over. So when Ivan approached me on this, I definitely said, "This is a challenge I would like to take." SD: Have you and Ivan worked previously on any projects? Or did he reach out based purely on your resume? JL: Ivan reached out to me. He was looking for somebody that had a strong technology background, but also had a background in the motorcycle-enthusiast community. I worked on five acquisitions for Fox. I'm very familiar with that world. On the other hand, he needed somebody who had the experience in supply chain and customer service and technology, contract manufacturing. I'm thrilled with Ivan's background. He’s a true international executive. He's had two major turnarounds, experiences recently with Gas Gas and creating a positive revenue stream. Then there is the Torrot company, which manufacturers electric scooters. He turned them around to become one of the leading scooter companies in Europe. So Skully Technologies is a good fit of like-minded leaders. Skully plans to give credit toward a new helmet to the customers who contributed to the old, bankrupt company's fundraising campaign. Skully photo. 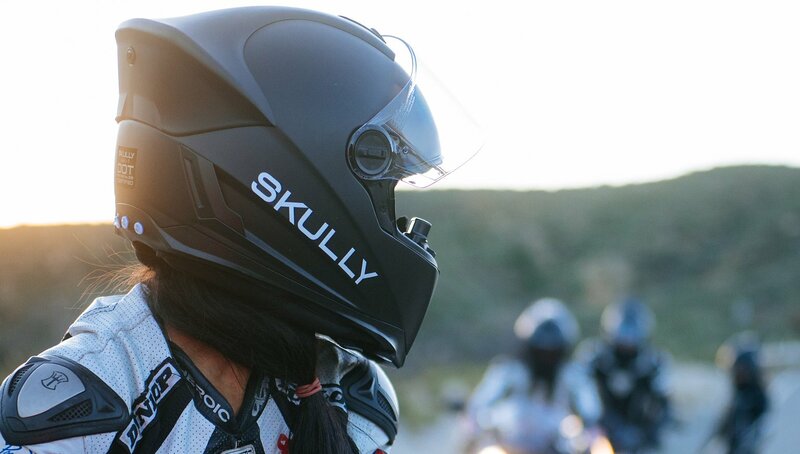 SD: While the Skully brand has been known for really interesting and innovative technology, many potential customers thought the helmet itself was less than impressive. Moving forward, are you going to improve that original helmet? Or are you planning on taking a kind of ground-up approach to developing a newer, high-end helmet with that same technology? JL: A lot of these things have competitive confidentiality issues, but I will tell you this: we are determined to improve the specs of the original AR-1, on most of the features. We are aware that the product could use updating in some areas, and we are determined to do that. Our first primary objective, though, is to return to market with the product, as soon as possible, so that the fans can finally enjoy what we're calling the "Skully Fenix AR." That's about all I can tell you. But yes, we are completely immersed in market research and getting up to date with improved specs and anything else that we need to update. SD: In the "About" section on your website, you mention artificial intelligence and augmented reality. Are there bigger goals that you see for the company, beyond the helmet? JL: Absolutely. This is just the beginning for Skully Technologies. We are recapturing the brand. We're going to go to market with the initial heads-up display version that the fans have asked for. Then we're quickly going to transition into expanding the technology with more AR features in the next model, all the way to full artificial intelligence down the road. With AI, the helmet will be able to think along with the rider, see obstacles or things that are in its path. That’s “future vision” kind of talk, but it's definitely where we want to go. We see this as just the beginning and plan to develop the product to its ultimate potential. But before we get to any of that we're going to give the enthusiasts the chance to get the helmet they really wanted. We really are determined to make the customer experience with Skully Technologies to be top-notch. It’s our goal to be a leading technology, safety, and top lifestyle brand choice in the future.